"I'm very disappointed and feel very bad that we didn't finish. I also feel bad that Vitor got hurt. He's my friend and I respect him a lot. I talked to him and his wife last night. My family didn't tell me that he had been taken to the hospital because they knew I would be upset. I called his phone later and his wife answered. She was on her way to the hospital and told me he was out for the year. That really hurt me. All the preparation we do and he's so dedicated, it's just very unfortunate. When I talked to Vitor he asked how I was feeling, I told him my knees hurt and I had a headache. We talked a little about what happened. I would never try to pass on outside of turn 1, not with less than 30 laps and with all the marbles. I'd never do that." - Raphael Matos, sharing concern for his fellow countryman as well as race strategies he would or would not apply. 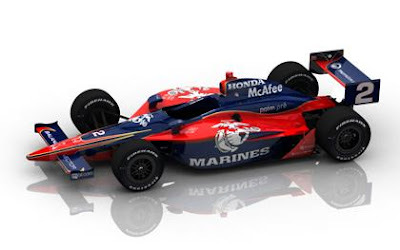 By the way, Rafa's got another smokin' livery for the ABC Supply/AJ Foyt 225 this weekend. No matter how many times I watch that, and it is hard to watch, I still think it was a racing accident. 50-50. I bet the car won't look like that Sunday night. The bottom line is, there are still presently, many less experienced (on oval) drivers & teams. That being said, there are ovals, and then there are 'ovals'. There is a reason why the large oval at the IMS has remained relatively unchanged over the years. The reason for this is, that it has always been something of a pinnacle, the benchmark that nearly all other auto racing events are compared to. It is not a place for ironing out set up problems or bolstering driver confidence. If you go racing at Indy, you had better be properly prepared…. Truthfully, all high speed ovals hold the potential for disaster but not quite so much as the IMS.... It is truly fortunate that the safer barrier was developed prior to the merge between the two leagues, it is additionally fortunate that the cars/teams are not any more competitive (and boringly vanilla) than they are, because if there was greater disparity in the ability to overtake etc. there would have been even greater carnage this past Sunday. I think it is safe to say that there were quite a few cars that were fast enough to win, but not nearly enough drivers with the ability to do so without destroying their cars and those of others in the process. I love open wheel IRL racing, I have friends in the business and I would love to see this sport burst out and realy become something, but it is going to take a lot more effort and brilliant ideas than Tony George could ever come up with. There are some really good drivers out there, guys from Champ Car that still don’t have rides, many, even racing in the Lights series (for 3, 4 or 5 years (Cunningham!!!!). But as long as the only thing it takes is a fist full of money and marginal driving skills to become a member, things will never change.